Our strongest roast, as intense as the New Mexico midnight sky. Live Boldly! Black Gold Tea. Black Gold Tea’s blend of tea leaves will fill your “cuppa” with a rich, aromatic smell and a bold taste to savor! Aromatic and rich, our Happy Trails coffee balances an inviting aroma with the rich, nutty flavor of hazelnuts. Pour a cup of Happy Trails Hazelnut for a smooth, mellow break in your day. Colorado River Green Tea is a refreshing blend of tea leaves that will give you a welcome moment of relaxation and peace. Kick back with a hot cup and let your mind be transported to the banks of the Colorado River on a sunny day. 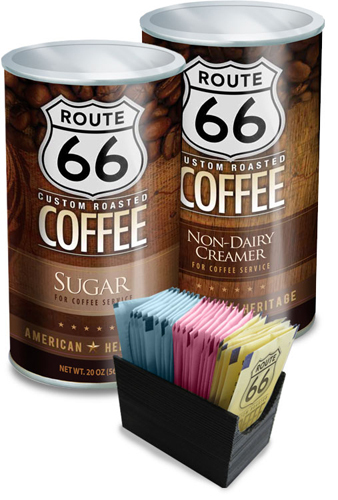 Route66® Coffee enhancements, such as non-dairy creamer, sugar, and other sweeteners are available to complete your break room and provide the full Route66 Coffee experience. Choose from our convenient bulk-packaged options below.